The first question we want to answer is: are there direct trains from Rome Fiumicino Airport and Ciampino Airport? No, unfortunately, you can not travel from the Rome airport Fiumicino (FCO) and Ciampino airport (CIA) without having to change trains. To travel from Leonardo Da Vinci Airport (FCO) to Ciampino city by public transport will require a minimum of 1 change. Additional changes may be needed on weekends and public holidays. The airport of Ciampino has no train station, you will then need to take the bus (Cotral / Schiaffini), every 30 minutes. The traveling time is about 5 minutes. The average travel time with Leonardo Express train is approximately 1:15 a.m.. 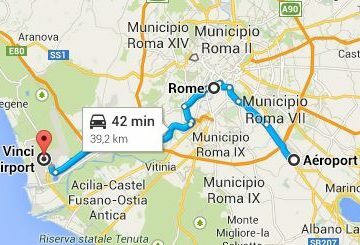 It takes 32 minutes from Fiumicino Airport to Termini Station (Central Station Rome), and after about 25 minutes a train from Rome Termini leads to Ciampino City (cost of the ticket is 1.50 euro); this trip takes about 15 minutes. Tickets, sold in the bus and on the ground, cost 1 euro. The price of a single ticket with the Leonardo Express train, valid for one trip is 14 Euros. For example, assuming you take the train to Fiumicino Airport of 10:53 AM, the expected arrival in Rome Termini is 11:25 AM. The first train to Ciampino City leaves at 11:54 AM, his arrival is expected 12:09 PM. Then you have to take a bus to the airport. We have negotiated a very good price. An example? 4 persons with two large suitecases and 2 carry-on bags, pay 50 Euros in total. This price is fixed, with no extras or hidden costs. It is valid for Rome Fiumicino Airport to Ciampino airport; and viceversa, from Ciampino Airport to Fiumicino Airport. It is a very good deal, if you consider that 1 Ticket train from FCO airport to Termini Station costs 14 euro. Without forgetting: you will get a Personal Meet & Greet. Your flight is monitored, you do not have to worries about flight delays. Instant reservation and confirmation.